Each CSV file should contain a header indicating the domain of data in each column. The first column should contain a sequential iteration or row number and the header label must be 'iteration'. The second column should contain the time the data applies to (each row should be sequential in time) with header label 'time'. The following columns headers should indicate the unique STEM location ID for which data in that column belongs to, and the values in each row is the count (individuals) at the location in the state represented by the file. If the data is from syndromic surveillance users will likely not have information on every possible state but when importing you must have files and file headers for each state that you want to display. STEM determines the type of the disease by checking which files are available when importing data, so if for example STEM finds an S_3.csv and I_3.csv file but no E_3.csv or R_3.csv file it will assumed the disease is of type SI. Note that the data in each column must be total count (individuals) and not fraction in each state. The numbers may be floating point (allowing fractional people infected for example). 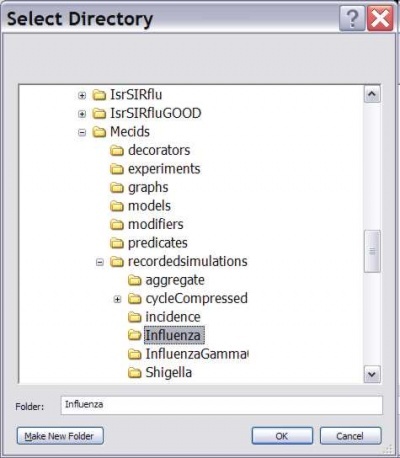 When you are ready to add the ExternalDataSourceDiseaseModel to your scenario (under the model node), click on the icon for adding a new disease. specify your project and give the disease a name. Select ExternalDataSourceDiseaseModel as the disease model. You must then tell the ExternalDataSourceDiseaseModel the location of your data file(s). You may use the selector button to the right of Data Path. A "Select Directory" dialog (figure 1c) will appear allowing you to select a directory that contains the data files you wish to play back. Figure 1b: Creating an ExternalDataSourceDiseaseModel. Figure 1c: Select the Directory that Contains Your Data. 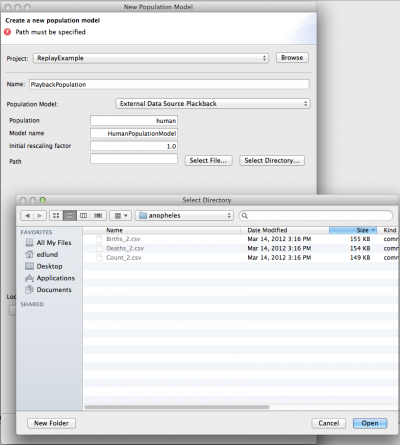 Once you have created a scenario set up to Replay a disease from an external file, you can also edit the data path using the Properties Editor. Just go to your project, find the ExternalDataSourceDiseaseModel you created under the "decorators" folder, and double click on it in the Resource Set window (See figure 2). 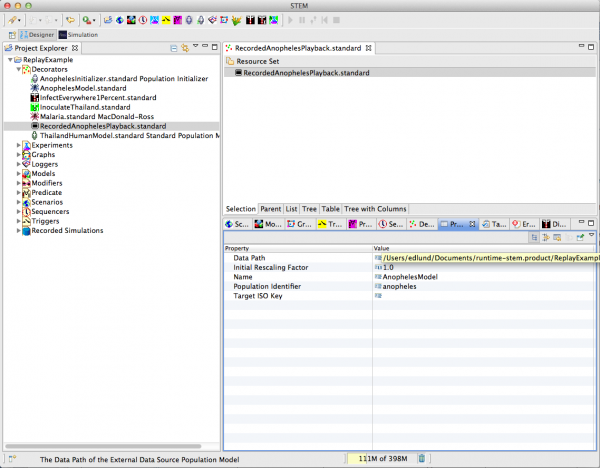 The Editor will show up allowing you to change this path used to read in data. 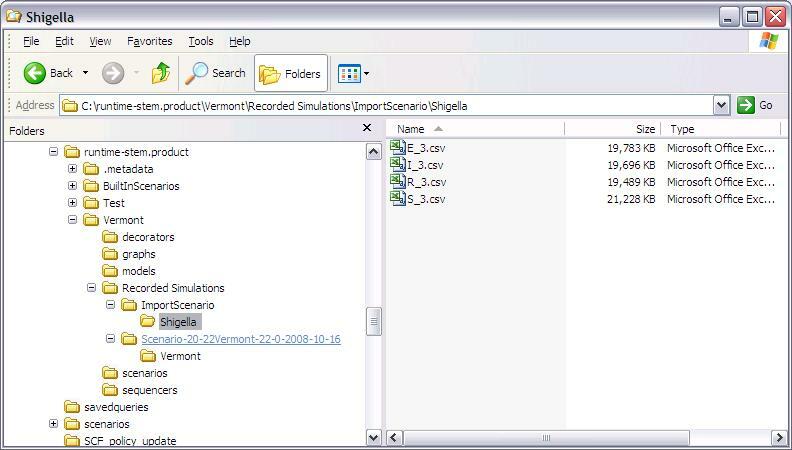 Once you have completed setting up your scenario, Save your work at this point by hitting ctrl-s. To replay your data, select the scenario you created in the STEM project explorer, right click, and select run. STEM will launch, load the locations you specified, and play back your data.